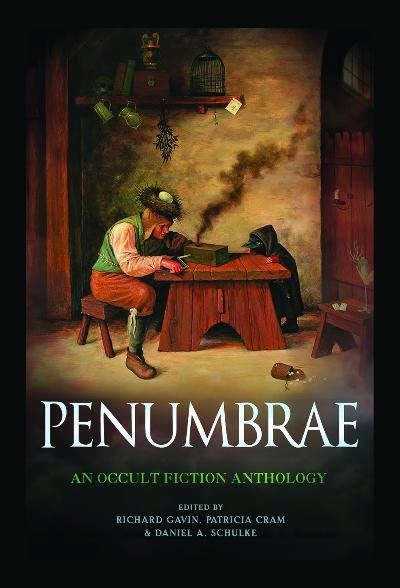 Penumbrae: An Occult Fiction Anthology marks my first endeavour into co-editing an anthology. My partners in this process were every esteemed indeed: Daniel A. Schulke and Patricia Cram. "As they are popularly understood, works of the imagination are often viewed as commodities, outgrowths of common human experience rendered into entertainments with which a consumer may employ to while away a few hours in an act of pleasant escapism. "But pulsing beneath this commercial detritus is a vital core that, when channeled with earnestness and skill, restores the creative imaginative faculty to its rarefied station, which, as Islamic scholar Henry Corbin (1903-1978) postulated, is the vital means of engaging with immaterial layers of reality that would otherwise remain unknown in the human sphere. "The locus of the present anthology is in work that embodies precisely such a metaphysical position, as opposed to fiction that merely employs metaphysical trappings to enforce a materialist worldview." Patricia, Daniel and myself proudly consider Penumbrae to be not just a gathering of fine writings, but also both a poisoned arrow and a signal fire to demarcate an oasis in the modern world, a clearing wherein the art of imaginal writing may be restored. Three Hands Press will be releasing Penumbrae in April. Pre-order information shall be posted here in the coming days.